Uggah holds the MD2 pineapple during the first harvest at Kampung Padang Pan in Balingies, Bau. On his left is Assistant Minister of Agriculture Dr Abdul Rahman Ismail. KUCHING: Sarawak which contributes 98 per cent of the country’s black pepper, is now poised to be the largest premium pineapple hub in the country. It all began with the first Milie Dilard (MD2) pineapple project in the state with the cooperation of the Malaysian Pineapple Industry Board (MPIB) and a local entrepreneur in Kampung Padang Pan in Balingies, Bau with the aim of making the farm a model for other interested entrepreneurs. With the opportunity available and the full support of the state government on developing the pineapple industry, Sarawak aims to raise acreage of the fruit to 3,500 hectares by 2020. According to MPIB, the acreage of pineapple in the state in 2017 was 1,342 hectares with a total production of 38,025 tonnes valued at RM48.22 million. The cultivation of pineapple in Sarawak is the second largest after Johor, according to the board. MPIB deputy director- general Mohd Khairuzamri M Salleh said based on the board’s monitoring, Sarawak is poised to be the largest pineapple producer in Malaysia. “Sarawak has extensive hilly land which has not been cultivated and the premium pineapple pioneer project in Kampung Padang Pan has proved the land here is very suitable for growing the fruit,” he said in an exclusive interview with Bernama recently. He said at MPIB level, the board had put in enormous efforts to promote and introduce the MD2 pineapple to the local community. “Demand for pineapple in Sarawak itself is strong as we can see the price of pineapples such the Moris, Josapine and Gandul varieties (non-premium) at local supermarkets reaching RM15 per kilogramme and supply is unable to meet demand,” he said. In this regard, Khairuzamri said to date, Malaysia is having a hard time trying to accommodate MD2 pineapple orders for export to China and the Middle East. He said China required 100 containers of the premium pineapple a month while Malaysia could only supply an average of seven containers a month to the country. “This is an opportunity for Sarawak! The geographical position of the state to China is nearer compared to the peninsula and this will also speed up delivery and reduce cost. “The shipping journey from Sarawak to China is only six days while from the peninsula, it is 11 days. Indirectly, MD2 pineapple will have a longer shelf life and can be marketed fresher to China,” he said. Commenting further, he said the state government should focus more on infrastructure, logistics and facilities at the port for smoother transportation and shipment. “The demand from China is not empty talk as there was a Memorandum of Understanding ( MoU) signed between the governments of Malaysia and China in 2017,” he added. According to MPIB, the Agriculture and Agro- based Industry Ministry (MOA) has also provided substantial allocation for pineapple development programme in Sarawak. BAU: Agropreneurs who are already successful but low in cash flow now have the option to go for venture capital (VC) which was set up by the Sarawak government to help farmers expand their farms. Deputy Chief Minister Datuk Amar Douglas Uggah said successful agropreneurs who had reached a higher level due to subsidy assistance would not be given anymore subsidy by the Sarawak government but would be eligible for financial assistance if needed. “That is where the VC that is set up by the state government comes in and it is available for agropreneurs. “It will be a lot easier than going to the bank because as you know the banks set a lot of terms and conditions. VC wants to relax the terms and conditions. It is not a loan but an equity participation and the agropreneur can actually sell back their shares to VC or we sell back the shares to him, which at the moment is ringgit to ringgit,” Uggah said when met after officiating at the first harvest of Premium Pineapple Pioneer Project, which is owned by a local agropreneur David Disam, at Kampung Padang Pan, KM8 Jalan Gumbang near here yesterday. He said the allocation for the VC this year is estimated at RM200 million and the idea of establishing the VC was mooted by Chief Minister Datuk Patinggi Abang Johari Tun Openg who wanted to move away from subsidy. “In a way, the establishing of VC is more like trying to create young farmers to become ent repreneurs, to be good managers, to be able to manage their farm, growing big and that will increase their income, push them beyond poverty level and go to middle- class level,” he said. Uggah, who is also Minister of Modernisation of Agriculture, Nat ive Land and Reg ional Development ( Manred), cited Disam’s 10,000 acres of MD2 premium pineapple variety as one success story of a pineapple farmer who earns RM30,000 profit a month from selling the pineapples and the suckers. As of 2017, pineapple farming in Sarawak involves about 1,342 hectares with total production of 38,025 metric tonnes and revenue of RM48.22 million. Currently, Sarawak is the state with the second largest pineapple production in Malaysia after Johor. “In Sarawak, we have almost 2,000 hectares of NCR land, of which 60 per cent is hilly and looking at Disam’s pineapple farm which is on hilly land, other hilly NCR lands could also be planted with pineapple. “I am sure other areas have a lot of potential as well. Pineapple is one of the crops that we want to develop for domestic consumption as well as for export. The chief minister has actually set a target for our ministry by 2020, we should be exporter of food products. “At the moment we are net importer of food products by RM26 billion. Looking at that, the chief minister has a very visionary objective, and it is to be done because we have hardworking people, young people, entrepreneurs, risk takers and visionaries, we have many of them. The only thing is how to create opportunity, I think the issue lies before us,” he said, adding the ministry was looking at pineapple, banana, coconut, durians and many others for commercial farming in line with the state government’s vision to transform agriculture as the main driver of economic growth in Sarawak. “Now we are moving away from oil palm to food products, our population is growing and we need food and I hope we will move along that direction. Focusing on and working with Malaysia Pineapple Board ( LNM), I think we can make a good breakthrough in a year or two,” he said. Malaysia is one of the countries that produces the world’s pineapple, and the state government is focusing on expanding farming of the MD2 variety in view of the great demand. “With a vast opportunity in pineapple farming, the Sarawak government fully supports the development of pineapple industry in the state and hopes to expand pineapple farming to 3,500 hectares by 2020,” Uggah said. 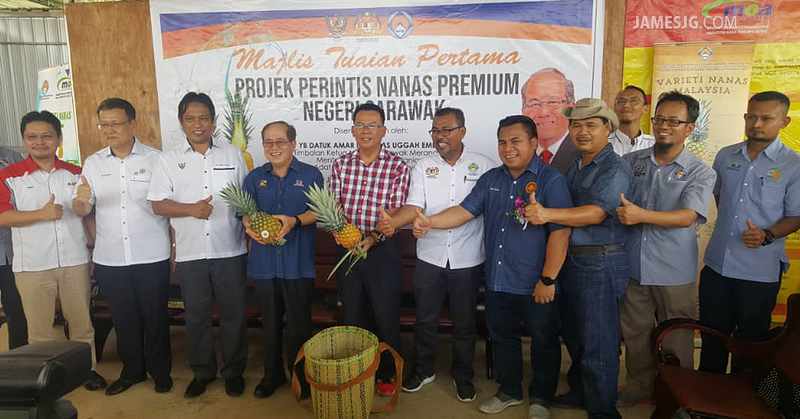 Meanwhile, Malaysian Pineapple Industry Board deputy senior director Mohd Khairuzamri M. Salleh hopes this first production of MD2 premium pineapple in Sarawak will attract the interest of locals to take up pineapple farming. “China needs at least about 100 containers a month but unfortunately, averagely we can only send seven containers a month to China. “Sarawak’s geographical position to China gives it an advantage because the distance between Sarawak and China is shorter compared to West Malaysia. “The planting of MD2 pineapples in Sarawak will boost the upstream and downstream activities of this industry. The opportunity is also widely open for the supplying of MD2 suckers at a lesser price because before this, they are brought from West Malaysia at a high cost,” said Mohd Khairuzamri. KUCHING: The Sarawak government has adopted the ‘anchor company’ model as one of the efforts to make Sarawak a net exporter of food products by 2030. According to Deputy Chief Minister Datuk Amar Douglas Uggah Embas, Sarawak has a very big potential in agro-based food production, having lots of land and ‘hardworking people’. He believes that Sarawak can move successfully towards this new direction – to go downstream on bigger scale – but the right model must be adopted. “That is why we are adopting the ‘anchor company’ model whereby the companies, which have the upstream experience, which includes planting, the processing facilities as well as the market to work with Sarawak government. “Top Fruit and RH Bee Farm are some of the anchor companies that have agreed to collaborate with the state government. I think we have got four or five anchor companies collaborating with us now, but I can’t remember the names of the other companies,” he told reporters after the closing and certificate presentation ceremony of food processing skill course for agropreneurs (bakery) here yesterday. Top Fruit deals with the exportation of durian paste, while RH handles the exportation of ‘madu kelulut’ (stingless bee honey). Uggah, who is Minister of Modernisation of Agriculture, Native Land and Regional Development, said by having anchor companies take the lead, the industry would be able to leapfrog Sarawak into the export-oriented agriculture market. He noted that developing entrepreneurs from the primary production right up to the market, could take a lot of time because upon embarking onto the international market, they must meet a lot of requirements. “Top Fruit, for example, can meet the international requirements in durian paste export. That is why we adopt the company as an anchor company so that we can export our durian paste overseas. “Last year, we exported 16 tonnes of our durian paste through their (Top Fruit) factory in Johor. “If we want to do it here, it would take time to meet the requirements. But eventually, we want Sarawakians themselves to set up this kind of factory and take the opportunity to meet the international standards, not only for the China market but also for the Asian market,” he said. Uggah reiterated that going downstream should be the new direction for Sarawak to consider seriously. He said the Sarawak government wanted to provide training to local entrepreneurs – for them to learn some of the production technologies so that they could set up the downstream products for Sarawak. This, Uggah pointed out, would also assist Sarawak government in its direction towards making Sarawak a net exporter of food products by 2030. He said local entrepreneurs too must try to venture into downstream products because not all the fresh fruits could meet the requirements of the ‘ fresh market’. “(Take) pineapples, for example. Not all pineapples can be sold as fresh fruits. Almost 40 per cent of the fresh fruits may not be able meet the requirements for the fresh market. Uggah believed that the increase in products for exports would also increase the source of revenue for the farmers – this would eventually help the government achieve its objective of raising the income of the farmers and bridge the gap between those in the rural and urban areas. Permanent secretary of the Ministry of Modernisation of Agriculture, Native land and Regional Development Dato Ik Pahin Joyik and Sarawak Agriculture Deportment acting director Dr Alvin Chai were also present.